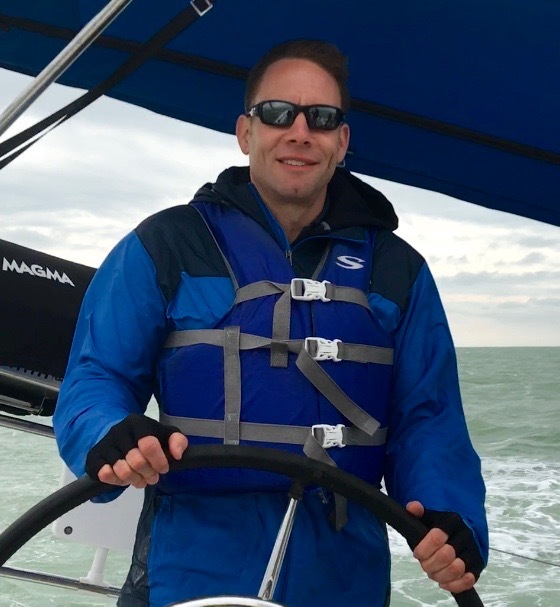 Ben Lawrence of State College, PA wrote this blog about an eight-day learning experience just before the holidays, that gave him “a brand new skill set, a sense of accomplishment, and a certification to charter a sailing yacht up to fifty feet long.” Read on for his full story. the back of his work van. I think it was in lieu of payment for some carpentry work but given its condition it’s just as likely he pulled it out of a dumpster. Regardless, we patched it together and occasionally took it out on a small nearby lake. I loved it! Something about harnessing Mother Nature’s wind power and gliding across the water made our little journeys feel like big adventures. “Fast forward through college, marriage, career, and kids and a few decades later the itch to experience high level sailing remained unscratched. Last week, however, my generous and supporting wife and kids gave me a pass to indulge in a sailing adventure I still cannot believe was real. For eight days a few other students and I traveled to Florida and lived aboard a forty four foot sailing yacht where we were drilled on nautical principles, vocabulary, laws, and techniques. Our captain and instructor, Rick, is a retired sailing professional who’s been captaining boats longer than I’ve been alive. Short of a parrot on his should and a patch on his eye, he possesses all the vigor and veracity you’d expect from a lifelong seaman. “Eight days later our motley crew returned to the harbor with sore backs, sunburned faces, calloused hands, and – miraculously – a boat in one piece. And you know what else we brought back from this adventure? A brand new skill set, a sense of accomplishment, and a certification to charter a sailing yacht up to fifty feet long. “To Offshore Sailing School, my fellow students Carlie, Richard, and Crystal, and to Captain Rick I offer a Thank You for a terrific learning experience. To you, my kind reader, I offer a challenge. What’s a skillset that intrigues you? What’s a bucket list item that you’ve long dreamed of experiencing but haven’t explored? This holiday season, forego the gifts under the tree and replace them with a learning experience that expands your comfort zone and instills fresh confidence. And if there are any guinea pigs out there – preferably strong swimmers – who are willing to “practice” with Captain Ben, I’m delighted to deputize you as a first mate J.